A proposed UK law could ban the sale of virtually all items containing ivory. The law would affect England, Scotland, Wales and Northern Ireland. As of October 6, 2017, The UK’s Department for Environment, Food and Rural Affairs (Defra) is seeking feedback from collectors, trade and the public on the proposed legislation through an online ‘consultation.’ Responses must be made before December 29, 2017. Comments can be submitted here. Input from the art and antiques community is especially important. The Defra has acknowledged that data on the trade is difficult to obtain. Knowledgeable and experienced dealers have an opportunity through the ‘consult’ to make the facts clear. The Defra Impact Assessment discusses options ranging from a total ban on the sale, import and export of any object containing ivory, regardless of its age, origin, artistic merit or historical importance – to a partial ban granting “strictly limited, carefully targeted exemptions” for small amounts of ivory. 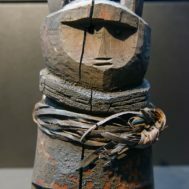 The data contained within the Impact Assessment shows that even a partial ban would have a significant impact on the sale of antiques as well as on the value of inherited worked ivory in the UK. The UK already controls its ivory trade through the implementation of the Convention on the International Trade in Endangered Species (CITES). However, UK elephant conservation groups say this is not doing enough to stop the illegal trade in ivory. Regardless of the actual impact of the British ivory trade on poaching, which appears minimal, animal-advocate groups say that a total British ban would send a message to other nations and impel these countries to ban ivory trade as well. The activist group Avaaz is currently engaged in a campaign ostensibly to test ivory items currently being sold in Europe through carbon-dating, to ‘prove’ that illegal ivory is being sold there, but its promotional materials do not reference any specific ‘consultation’ and do not mention the UK. In 2016, Action for Elephants UK coordinated a letter campaign to Prime Minister Theresa May, advocating ending sale of all ivory in the UK. Numerous dignitaries and UK politicians, across parties, signed the letter, including William Hague, Jane Goodall, Stephen Hawking, Richard Leakey, Joaquin Phoenix, Tim Farron, Caroline Lucas, Ed Miliband, and Richard Dawkins. On multiple occasions, Prince William has publicly called for a ban on Ivory sales and, according to Jane Goodall, has said he would like to see all the ivory in the Buckingham Palace destroyed. 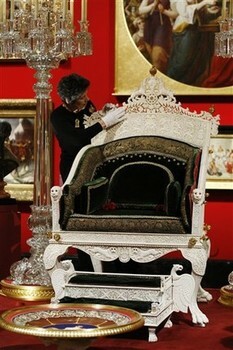 A staff member of the gallery checks the Queen Victoria’s South India ivory throne and footstool. Buckingham Palace, London. Note that the similar concerns were raised by the Association of Art Museum Directors on July 29, 2015, regarding changes to US ivory law, in Comments Regarding Endangered and Threatened Wildlife and Plants; Revision of the Section 4(d) Rule for the African Elephant. In a recent article in the Antiques Trade Gazette historians Alan Titchmarsh and David Starkey discussed the perils of the potential ban on ivory. Starkey stated that to cease the trade of antiquities would be an act of “cultural vandalism.” He felt that “If these objects cease to be tradable they lose their value and will end up being destroyed.” Others expressed concern that museums would lose their ability to exhibit ivory works of art both in the UK and in exhibitions in other countries. The lack of ivory objects would distort the historical picture and relationship to art’s historical context. These experts also questioned how trade in antique ivory procured and carved hundreds of years ago could affect the fate of elephants in 2017.
musical instruments which contain ivory. items which contain a small percentage of ivory, and where the ivory is integral to the item – a de minimis exemption. 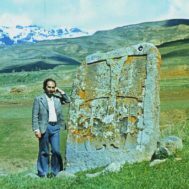 items which are of significant artistic, cultural and historic value. the continued sale of ivory to museums, and between museums. The UK is currently looking at the de minimis exemptions in U.S. state and federal law where the federal ban includes a 100 year rolling ban with a de minimis exemption for items containing less than 100g ivory, and comprising less than 50% ivory by value and volume. California’s threshold is 5% by volume. Elephant protection has been an increasingly controversial issue in the UK after reports surfaced of a rise in poaching since 2007. In 2015 the Conservative Party promised a total ban on ivory sales as part of its manifesto, although that was dropped in 2016. In August, the UK was named as the largest legal ivory exporter after an internal analysis of CITES records. Given the erroneous, but still prevalent conflation in the public mind of legal sales of pre-1947 ivory with contemporary poaching, government was embarrassed. Poaching is a serious problem, but Defra identifies the illegal market as driven by China and other Asian nations, not the UK. Increasingly rapid habitat loss is also driving the killing of elephants as a pests and nuisances in Africa. As Defra notes in its “Why we’re consulting” section, “since 2006 the total number of elephants in Africa has decreased by approximately 21%, with numbers of savanna elephants alone declining by 30% (equal to 144,000 elephants) between 2007 and 2014, primarily due to poaching.” Elephants reproduce at a rate of 5%, so if the elephant population continues to decline at the current rate, extinction could come within a few decades in some countries. The extinction of elephants could have disastrous consequences. They are a “keystone” species, integral to the functioning of whole ecosystems. If the elephants are gone, other species of plants and animals will be dramatically impacted, including the human populations that make a living through tourism revenue and money from elephant conservation projects. The UK currently regulates ivory through the ratification, in 1976, of The Convention on the International Trade in Endangered Species (CITES). Defra states: “The commercial use of ivory specimens acquired before the date on which the provisions of CITES started to apply to ivory is permitted (1990 for African elephant ivory and 1975 for Asian elephant ivory) only if the necessary permits have been issued. Only goods which have been worked before 1947 (in other words, not raw ivory) can be sold and exported without a permit. Post 1947, government-issued permits may allow for the importation or (re-)exportation of items containing ivory, prior to 1990 for African elephant ivory and prior to 1975 for Asian elephant ivory – from/to a country outside the European Union, or for the use of ivory in commercial activities within the EU. 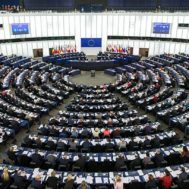 British authorities say that even after passage of a new law, they may continue to recognize pre-1947 certifications and permits from other European countries. Despite increasing restrictions globally and condemnation of the ivory market by Asian politicians, there has been a marked increase in the illicit ivory trade in Asian markets since 2007. Though not all the mechanics of the illicit trade are known, undercover field-work, by the international organization WildAid, revealed that poached ivory is marketed as legal ivory through the falsification of permits, weak regulations and poor oversight of the ivory trade. China has announced that it is closing its domestic trade by the end of 2017. (See Committee for Cultural Policy, China Pledges to End Contemporary Ivory Trade in 2017, December 30, 2016) To prevent the ivory trade from taking up residence next door to China, Hong Kong has also announced that it is banning international trade in ivory and instituting a five year phase out of its domestic ivory trade. Under Director’s Order No. 210, as a matter of enforcement discretion, items imported prior to September 22, 1982, and items created in the United States and never imported must comply with elements A, B, and C above, but not element D. “Enforcement discretion” means that although there is not an exclusion for this category of pre-1982 imports and USA-made items, the F&WS has decided not to enforce Section D. This “enforcement discretion” is reassuring, but not totally reassuring, as the exemption is wholly dependent upon the officer handling a matter. There are some who question whether bans on ivory are actually detrimental to elephant populations. Dan Stiles, has been researching ivory markets for 15 years and is a member of the IUCN/SSC African Elephant Specialist Group. In 2014 he wrote an opinion piece entitled Can Elephants Survive a Continued Ivory Trade Ban, discussing the economic reasons why bans have historically led to an increase in poaching. Although the conventional wisdom is that a ban on ivory will cause the market value of the ivory to decline and prevent poaching, Stiles and others say this may not actually be the case. After China’s ban on ivory last year, prices did fall significantly but poaching has not decreased. Though it may be too soon to tell, there is some thought that low ivory prices may actually increase poaching as individuals who are holding ivory on speculation can buy more quantity, thereby increasing the demand for ivory. In an article in The Guardian, Dan Stiles confirmed that there has been no decline in poaching with the China’s recent ban and said, “That to me means a drop in price is actually bad for elephants. Because these guys can buy more ivory for the same amount of money as before.” Others interviewed in the same article said that harsh punishments in Africa and China for illegal trade and false documentation would be most effective in putting the illegal ivory trade out of business. International groups have proposed carbon dating techniques as a means of verifying ivory age, but according to Defra’s Impact Assessment, “Carbon dating techniques have limited application due to the volume of the sample required, which on smaller or finer items would destroy and/or devalue the item. It would also impose a greater burden on enforcement authorities. Further, scientific researchers generally regard carbon dating as a potentially useful technique to corroborate a range of dates, not to establish fixed years.” Since the legal dates for Britain are now pre- and post-1947, the technology could be useful, but without accurately dated comparable materials to test against from the same region, it would be difficult to know for certain that an item was created in a particular year. Because an enforcement model has not been designed, the Impact Assessment has little to say about the cost of enforcement. Currently the police, including the National Wildlife Crime Unit, are responsible for enforcing CITES controls on the sale of ivory in the UK and work in conjunction with the Animal and Plant Health Agency’s CITES compliance team. Enforcement resources are cited in Defra as an additional expense for a regulated trade with antiques exceptions. As Richard Ellis mentioned in his Opening Address to the 4th Art Market Business Conference, delivered at Church House, London on September 6, 2017, there is a shortage of resources to support UK’s enforcement agencies. He discussed a 25% reduction in finances over a four-year period, beginning in 2014, and also cited HM Inspector of Constabulary’s report to the Government on the “Perilous State of British Policing,” warning that a shortage of detectives amounted to a “National Crisis.” His opening address came on the heels of the Grenfell fire disaster. There were concerns, since somewhat abated, that the Scotland Yard Art and Antiques Squad, which had been reallocated to the fire, would be permanently closed. Undoubtedly, the additional economic costs of enforcement of a partial ban – compared to a total ban – would be far less than the economic losses, businesses closures and other costs impacting the British antiques industry under a ban. Defra does not even attempt to calculate the overall public economic loss of value as a result of the devaluation of collections, private property assets and inheritances. Conservationists, antiques dealers, museums, collectors and the public all agree that the survival of elephants is an ecological and moral imperative. Whether a ban on the British antique ivory trade will help is doubtful. The British government urges the public – and not only the British public, but also those concerned globally with the implications of a British ban, to make their voices heard. The UK Ivory Consultation closes December 29th, 2017 and is actively looking for input from the antiques trade.